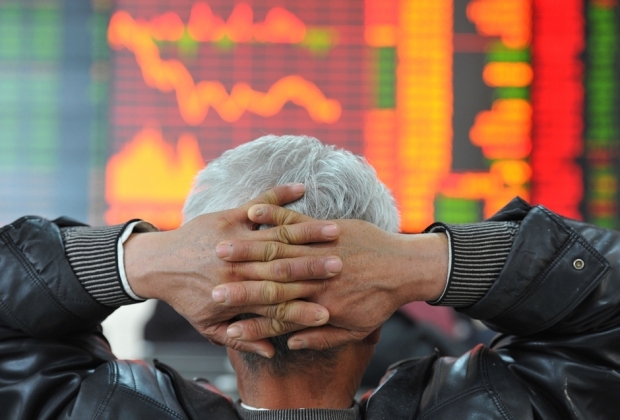 An investor watches the electronic board at a stock exchange hall on February 19, 2013 in Fuyang, China. Last year, the owner of an export-processing company whom we will call Lin Minyao learned of an easy way to make money in Shenzhen, the port city next to Hong Kong. Like his fellow traders, Lin said he could set up two shell companies, one in Hong Kong and the other in special areas set up to encourage trade in Shenzhen, to fake trades and profit from the different yuan exchange rate in the two cities. Despite the trouble, many small trading business owners like Lin were mulling the risk because recently exports had “really slumped,” he said. That pessimism stands in sharp contrast to official data, which paints a picture of buzzing cross-border trade. In April, national imports and exports reportedly totaled almost US$356 billion, up 15.7 percent from the same period last year. Shenzhen customs, which oversees trade in the port city and in nearby Huizhou, reported dazzling year-on-year growth of 74.6 percent in first quarter imports and exports to the tune of US$245 billion. Of that, US$69 billion went to or from Customs Specially Supervised Areas (CSSAs), an increase of more than seven-fold from the same period last year. CSSAs are bonded areas set up to encourage trade. Their rules for taxes, customs, and foreign exchange administration are all different from other parts of the mainland. In Shenzhen alone, the amount of exports in January through March was nearly US$93 billion, a 68.8 percent increase over the first quarter of 2012. Last year posted a growth of only 2.4 percent. Preferential policies are crucial to CSSAs. Trade between Hong Kong and Shenzhen’s bonded areas, for example, is not subject to the same quota requirement as that involving an onshore enterprise. The forex regulator is also less demanding when it comes to companies in bonded areas. But they have apparently been abused by companies wanting to make money from arbitrage. In the past two years, it has become common to fake trades, mostly with Hong Kong, through one-day trips in and out of bonded areas in Shenzhen, a source at a trading company said. The regulators have reacted. Shortly before the national trade figures were announced, the State Administration of Foreign Exchange (SAFE) imposed tougher requirements on banks and trading companies to discourage capital flows not backed by real exchanges of goods and services. Also catching the authorities’ attention was the gold-processing trade. In less than two years, the amount of Chinese exports of roughly processed gold grew from a negligible base to more than US$1.2 billion for the first four months in 2011, says a government-backed research report. The surge was unlikely to have been driven by consumption because the report says much more work needs to be done before roughly processed gold can be used to make jewelry. The value of finer processing that could meet the consumption requirement, on the other hand, totaled only US$450 million for the first four months of 2011. A Shenzhen official who asked not to be named said local governments were partly to blame for fanning the flames of fake trades because they were chasing high trade-growth targets. Banks have also played an enabling role in the operations because they need greater trades to boost yuan settlement. The central bank’s branch in Shenzhen reinforced the incentive by imposing a monthly target of yuan trade settlement on local banks and ranking their performance publicly, a local bank executive said. Banks also made it easier for companies to arbitrage through trade-financing tools. A trading company can deposit funds at a domestic bank and use this as collateral for an overseas subsidiary to borrow from the bank’s offshore branch. It reduces the company’s financing costs because getting the same amount of forex often requires less yuan in Hong Kong than on the mainland. There were times that the two sides’ exchange rates were more than 400 basis points apart, says a research report by Ding Anhua, a chief economist at China Merchants Securities. On December 31, the exchange rate in Hong Kong was 6.2235, 68 basis points lower than the rate onshore. That means converting every US$1 million in Hong Kong costs 6,800 yuan less than in a domestic bank, his report says. Many arbitrage schemes involve a letter of credit, a trade-financing tool that allows companies to borrow from banks for short-term loans. Getting it requires the applicant company to prove its intention to use the loan for trading. That is one big reason companies fake trades. Some overseas loans have been channeled to domestic banks’ wealth management plans, which offer yields higher than the borrowing cost. With the right bet on the offshore yuan Non-deliverable Forward, a futures contract, the borrowing company also stands to benefit from yuan appreciation. Reining in trade-based currency arbitrage could be difficult, the Shenzhen government official said. Take rough gold processing for example. Customs is in no position to stop the business because simple processing is a legal business in bonded areas, he said. But SAFE’s tougher forex requirements may have begun to bite. One trader in Shenzhen’s Futian bonded area said his company stopped faking imports and exports. Banks have halted financing to re-export businesses, a banker familiar with the situation said.